The Everol Drag Scale was unique and innovative in 1958 and it is just as revolutionary more than 50 years later. This is the only reel on the planet that tells you how much drag you are applying on the line at any moment in time. It is a huge advantage in catching fish over 200 pounds. It is an almost unfair advantage when fishing in big money tournaments with jackpots reaching $1,000,000. The system is simple! 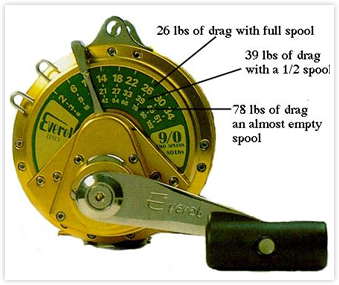 The numbers on the outer ring represent the amount of drag in pounds being applied for any given lever position when the spool is almost full of line. The middle set of numbers corresponds to the drag being applied with Half a spool of line remaining. Finally, the inner numbers correlate to the drag setting with the reel almost empty of fishing line. So as you can see, if you catch a fish with a full spool and it peels off line, the drag you are applying increases by a factor of THREE, even if you don’t move the drag lever! This is true of all reels, not just Everols. It is simple physics, but it is also a leading cause of break-offs. The line breaks because the fisherman is unknowingly applyling much more drag than he realizes. To maintain a constant drag force, a skilled angler must slowly pull back on the drag lever as the fish takes line. That can never happen with an Everol. The drag stop ring can be set to a maximum setting before the boat leaves the dock. So no matter how strong your fisherman is he will not be able to advance the drag lever too far and lose your prize fish.